The LW7/.82Sx24 Weapon System is the result of over 11 years of research by Leitner-Wise at the forefront of ballistic design, a system that seeks to provide the military and law-enforcement community with a comprehensive strategic solution to many existing mission requirements. It is, without doubt, superior to all current and prototype munitions in this class. And this is one class that is hard fought. Leitner-Wise engineers have wisely chosen to work with the known ballistics of the 5.56mm, 55 and 62-grain projectiles, presenting them in a deliverable package able to comfortably fit within existing handgun and submachine gun designs. This is contrary to other manufacturers who have or are developing proprietary high-velocity projectiles at the expense of size and mass. The .82Sx24 mm round is based on a 10mm Auto cartridge case, chosen for its internal case volume, and a 5.56mm standard US Army type frangible projectile. A sabot, manufactured commercially, and holding the projectile allows it to develop the desirable high muzzle velocities, within a short barrel, and flat trajectory combined with low recoil forces and a manageable pressure curve that does not unduly stress the host weapon. The effective incapacitating range of the 7.82S when fired from a pistol or submachine gun now exceeds 175 meters. The sabot allows many alternative projectile payloads to be carried in the ammunition, leading to substantially lower munitions costs. The LW15S CAW is based on the existing M16 design, where some of Leitner-Wise s strongest expertise lies, and essentially is the replacement of the 5.56 mm chambered barrel, for one chambered in 7.82Sx24mm. Cutting a new chamber in a standard .30 caliber barrel blank, and utilizing a new magazine accomplishes this. The result is a very small sub-machine gun exhibiting all the desirable features of the full-sized 5.56 mm version, but having a communality of ammunition with the LW70S pistol and a shorter range than the full-sized version for use in a fluid urban environment. As most the weapon is produced from existing components, production and costs do not exceed that of the comparative host, yet the ammunition, even in its low volume production form, is competitively priced. As noted previously, this is a highly competitive market sector with three of the worlds major arms manufacturers debuting new weapon platforms and new ammunition. Tough competition has never fazed the engineers at Leitner-Wise. FN, Heckler & Koch and Bofors are all demonstrating PWD platforms and munitions that they claim meet the requirements of a future PDW fielded system. Substantial funding and investment has been placed in each of these systems and every opportunity is used to bring them to the attention of the potential buyer. The problem with all the main systems is that the projectile has been reduced dramatically in weight in order to achieve the muzzle velocities high enough to penetrate body armor as required, but at the expense of terminal ballistics. Though they may claim and show results to the contrary, US Forensic labs have concluded that the FN P.90 5.7mm round is less effective than 9mm! The overriding concern has been the penetration of body armor and in particular CRISAT armor, delivering a PIH level greater than 0.6. (CRISAT armor is the name given to the future NATO classification of Red Team body armor. CRISAT is made from 1.5mm titanium and 20 layers of Kevlar). Leitner-Wise has chosen to use the known performance of a standard US Army 5.56mm type frangible projectile in order to achieve a workable result. In this way the level of investment and R&D proving has been substantially less due primarily to the data for the projectile that exists in the public domain together with the ease of obtaining an extensive range of these projectiles from established commercial manufacturers. Further, with all of the other systems, it is necessary to not only purchase the ammunition, but to invest in new weapons as well. The LW 7.82S x 24 mm Weapons System is the only platform that can be retrofitted into existing in-service firearms with a substantial reduction in budgetary requirements. The LW7/.82Sx24 Weapon System is the only current viable new lead free ammunition program that meets all requirements for fielding in a high logical and cost effective way. It has the ability to open more potential marketing opportunities than the other systems that rely upon the commitment of the end-user to one, and only one supplier and a limited number of delivery systems. The LW 7.82S x 24 mm Weapon System has the ability to be tailored to each customers requirement and current weapons inventory. 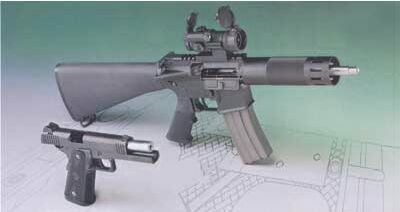 A customer can specify a complete new Leitner-Wise weapons program, a retrofit of existing inventory or a new third party weapon system chambered for the LW 7.82S x 24 mm cartridge. No other prototype or current system offers this unique diversity, quality and customer service. As proof of this, Leitner-Wise is now under contract to deliver this system to a US government agency.